At Race Orthodontics, Board certified orthodontist Dr. Kevin Race and his team utilized the latest in orthodontic technology. Cutting-edge procedures, techniques, and equipment help us determine orthodontic issues with expedience and accelerate your treatment. 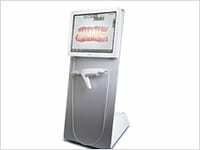 The iCAT 3-D Dental Imaging System produces optimal images with unparalleled accuracy. As patients increasingly ask for more sophisticated and immediate diagnostic results, this advanced in-office imaging system provides Dr. Race with more accurate information for diagnosis and treatment planning. This includes a wide range of orthodontic problems such as TMJ disorders, enlarged tonsils or adenoids, impacted or missing permanent teeth and other dental abnormalities. Dr. Race can precisely plan the exact movement of the teeth without the guesswork of traditional, 2-Dimensional X-rays. In addition to moving teeth, braces affect the position and shape of the surrounding bone, gums, lips, cheeks and muscles of the face. With our 3-D CT scan, we now have the ability to create a complete treatment plan for all factors that the braces will affect. This gives our patients a more beautiful and healthy smile in an extremely precise manner. This imaging technology uses 95% less radiation than traditional hospital-based CT scan machines. Getting an accurate impression is crucial for effective treatment and orthodontic care. The iOC Scanner captures the contours of tooth and gingival structures, producing a highly accurate digital orthodontic scan in just minutes. The iTero handheld wand creates a digital 3-D image of your teeth. The doctor and patient can view this image on a screen in real time. The need for taking traditional putty impressions is eliminated, and with no physical impressions needing to be shipped to a lab, the digital image is available in the Invisalign Clincheck system the next day. The advantages to both orthodontist and patient are quite clear – this system affords superior accuracy, increased patient comfort with no invasive putty impressions and goopy aftertaste, and a faster, more accurate diagnosis of your orthodontic treatment needs. This scanning wand makes it fast and easy for Dr. Race to capture 3D digital impressions of your teeth and mouth with one of the most accurate, least invasive technologies available. Developed by Zahn Dental Labs, the 3Shape Trios scanner completely eliminates the need for physical impressions and maintains accuracy even if the patient moves. Dr. Race can show you the images on a computer during the scan in real time – the result is a shorter appointment, a more accurate diagnosis and greater comfort for you.